We are gratified to announce a new Joanna Zorya DVD, Martial Power. Before Joanna’s untimely death several years ago, she told us of several unfinished projects that she was working on. Sadly, she did not have time to finish them all, such as the anticipated second volume to the Xing Yi series. But her friend and partner, Julie Hinder, contacted us with the good news that at least one of the un-produced DVDs was viable, and asked us to publish it, along with the others we had acquired earlier. With a theme of power through physics, Joanna employs extremely relaxed arm and waist exercises to loosen the shoulders, and support the proper relationship for “soft power,” striking with muscles just tense enough to align all your force. Joanna Zorya joined our Plum offerings a long time ago. She and her partner, Julie Hinder, mailed a DVD to us. The video showed them demonstrating and teaching—once the furniture was cleared to the sides of the room—a number of principles of Tai Chi. As I watched the techniques performed I could immediately see two things: that Joanna was working against definite physical limitations (mainly in her hip) and, even more importantly, that many of her demonstrations were strikingly accurate and clear. On top of that, she presented a deeply concerned martial artist with a metaphoric mind and great insight into martial practice. We did not always agree. Her stance on Tai Chi without Qi was, I think, misunderstood by some people and, more likely, a prescription for contention. But that she loved the art was evident in each frame. She had strong words and considered approaches, demystifying when they were applied. And, honestly, how long could you take offense with someone who let sheep roam behind her during outdoor sessions? Despite having what was, no doubt, a sometimes discomforting inability to tolerate soft thinking, she was actually a humorous, kind, generous and loyal colleague. This qualified her to a position we had, at that time, rarely given: posting her products under her personal name, not the styles represented. We were delighted and surprised to find how much respect, acceptance and admiration a relatively unknown teacher found from Plum customers. She is among our bestselling teachers to this day. That’s how unique Joanna was, even to the point of passing away, too early, from an illness shared by only one other person on earth, and that person living in the same town she did. We hope you will enjoy this presumed “last” effort from Joanna, a project spotted with her animated touch and well-missed spirit. Of course, no teacher who has taught as openly and as generously as Joanna can really be said to have a ‘final’ contribution: her teachings and spirit live on in her students, those who touched hands personally with her, and those countless others who have the opportunity of finding her in her writings and videos. Posted October 10, 2017 by Ted Mancuso. Comments and trackbacks are open. Follow the comments feed. Tagged with: Fa Jin, fa jing, focus, kime, martial power, On Bagua Zhang, physics in martial arts, Taijiquan, xingyiquan. Joanna was a wonderful Kung Fu Practitioner. 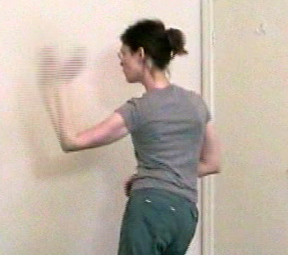 Her writings and video footage display much of her spirit and intensity for Kung Fu. The one thing I admired about her she never became lazy in her art, even during her illness. She lived and practiced what she believed in. Her material would for sure be inspiring for new enthusiast and like minded seasoned practitioners alike. Although I never met Joanna, I was certainly an admirer. Her Bagua disc gives the impression that she trained and taught the way a lot us us “out here.’ do. Move the furniture aside or go out and train among the sheep. No big ego, but a self confident practitioner and teacher who knew what she was doing. Her teaching was plain and effective, her applications arose from the position of her body under attack and were driven by her footwork. They did not look like someone from “sport karate” playing at kung fu, but arose naturally from the uniqueness of baquazhang. What a perfect and beautiful way to describe Joanna’s teaching and art. Thank you. She is missed but, thankfully, we can still ‘access’ a part that was so important to her.